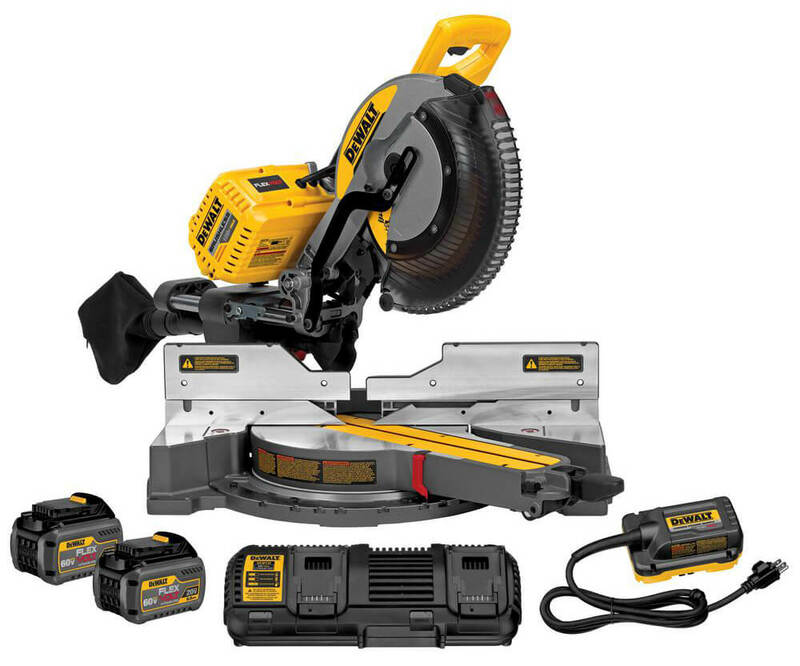 3.0.1 Who would benefit from having the DeWalt DHS790AT2 FlexVolt Miter Saw? The DeWalt DHS790AT2 FlexVolt 120V Max Miter Saw is a top-of-the-line new miter saw. The FlexVolt technology is the first of its kind, as you can use either a power cord to power your miter saw, or you can use the FlexVolt 60V battery to power the miter saw. When the battery is at full strength, you can cut over 300 pieces of 3 ¼” baseboard. What really sets this technology apart, however, is the batteries are backwards compatible. This means the battery will automatically adjust Voltage when you change tools, so the 60v battery will work with all of your hand held 20V battery powered DeWalt tools. In addition to this technology, the miter saw delivers accuracy that is top notch and hard to beat. It uses an adjustable miter scale which has multiple detents. The powerful 120V brushless motor allows you to run longer than brushed motors. This miter saw is durable, compact and lightweight, and high quality. The performance alone is above and beyond its competitors. Who would benefit from having the DeWalt DHS790AT2 FlexVolt Miter Saw? FlexVolt is the latest and most revolutionary technology within the power tools market. DeWalt has developed the technology which allows your battery to know which tool it is working, and automatically provide the appropriate amount of voltage to that tool. This doesn’t work with older versions of your tools, as the battery can only detect the voltage for any 120 Volt, 60 Volt and 20 Volt DeWalt tools. But, having this freedom of being able to take your battery from a drill to a miter saw is the first of its kind, and opens up all kinds of possibilities for future products. The FLEXVOLT battery is backward compatible with our 20V MAX* tools so you get up to 4x the run-time. And because the FLEXVOLT battery is the only battery that automatically changes voltages when you change tools, you can slide the battery into a whole new lineup of 60V MAX* and 120V MAX* tools from DEWALT. The DeWalt DHS790AT2 FlexVolt Miter Saw comes with the CUTLINE ™ blade positioning system. This system allows you to adjust the cut angle as needed by allowing the user to see where the cut will take place by looking at the shadow of the blade as it comes down to the cut. In addition to this, the bevel scale is easy to read and allows for maximum accuracy. The detent plate adjusts to 10 different positions, with stop miters at 50 degrees to the left and at 60 degrees to the right. The increased flexibility with the angles allows you more options to make the cut just once, compared to some of the other saws in the market which only allow you to go 45 degrees in either direction. The DeWalt DHS790AT2 miter saw includes everything you will need to start using your miter saw right away. Included with the saw are two 60V Max lithium-ion batteries, which will need to be charged when you first open your miter saw. This saw comes with a Dual Port Charger, so you can charge both your batteries at the same time, saving you time and money. It also contains a 12” blade, the blade wrench so you can change your blade out quickly and easily, as well as a dust bag to help you keep contain the mess the saw makes. Ability to run off a power cord, or the battery – unique and first of its kind. A Dual Port Charger, to help ensure you are without battery power for the least amount of time. The light weight of the saw allows for easy portability. The FlexVolt technology can only be used with the newer DeWalt tools. If you have a 12, 18 or 24 volt tool, the battery packs are not interchangeable with this new miter saw, and vice versa. Is the tool easy to clean? Ans: The stainless steel detent plate allows for easy cleaning. Just make sure you still adhere to the normal saw safety ideas while handling blades. 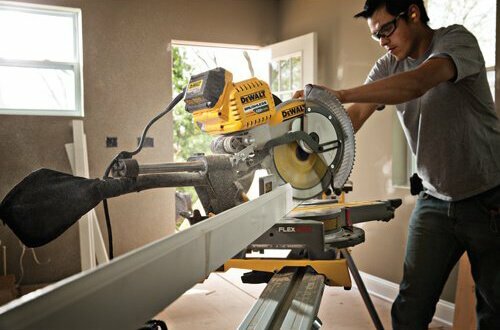 How long does the DeWalt FlexVolt Miter Saw run? 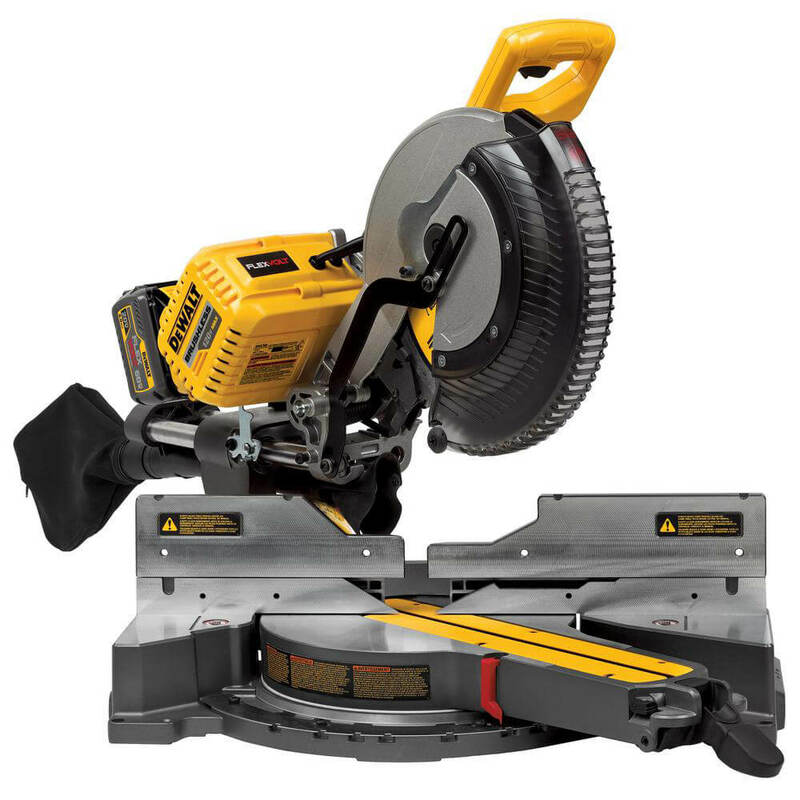 Ans: This particular Miter Saw can cut over 300 3 ¼” baseboards in one battery powered session. Is this miter saw heavy? Ans: The saw itself weighs 56 lbs. which would allow for easy movement and transportation. When you have the blade and all the accessories on the saw, it can weigh up to 75 lbs., which is average weight for most 12” miter saws. 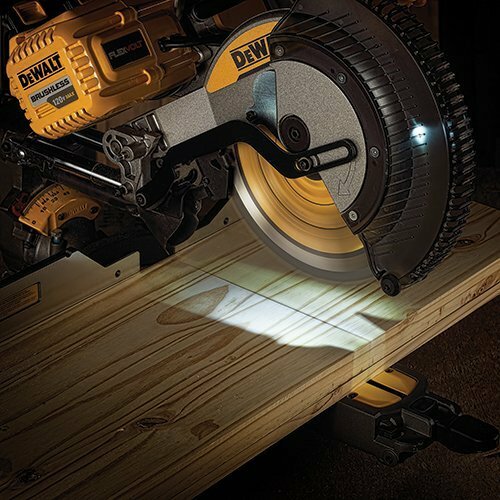 Overall, the DeWalt DHS790AT2 FlexVolt 120V Max 12” Double Bevel Compound Sliding Miter Saw is perfect for anyone looking for flexibility while completing their projects. By allowing the user to switch between the options of running the saw corded or utilizing the FlexVolt batteries, every project can be completed with ease. It is due to be released into the marketplace on Monday, August 22, 2016. 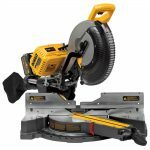 Buy DEWALT DHS790AT2 FLEXVOLT Compound Miter Saw On Amazon, Now!